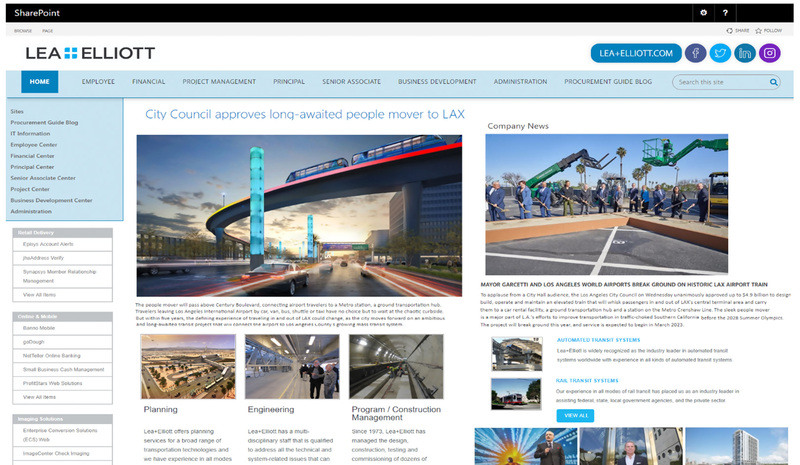 As the Lea+Elliott organization desired to upgrade their current infrastructure, many outdated platforms such as SharePoint 2010 existed which needed a facelift. They wanted to provide a fresh look to their intranet as well as ensure it was mobile compatible and the organization wanted to move to a cloud-based Office 365 environment to ensure no future infrastructure updates were ever required again. The organization found that the existing SharePoint 2010-based intranet was causing delays in communication and they had a need to increase their overall knowledge management capabilities. There was a desire to increase their users search capabilities within departmental team sites and engage the sales teams with new capabilities to assist them in performing their daily activities. There was too much of a reliance on siloed and outdated document libraries and the HR department had a need to more securely store their content in a more audience specific manner. As Lea+Elliot reached out to EPC Group for assistance, we were able to provide a detailed roadmap and approach that provided them with a secure cloud-based Office 365 solution that integrated with their existing Active Directory architecture. EPC Group worked closely with key stakeholders to develop an existing new “look and feel” with departmentally specific content and related layouts that greatly increased end user adoption. EPC Group worked closely with the IT stakeholders to deploy features and functionality, alongside of SharePoint Online, to include Microsoft teams that brought in a whole new method of collaborating while allowing users in the field to perform these actions securely on their mobile device. The organization is now collaborating with documents and content in SharePoint Online as well as Microsoft Teams on an infrastructure that has greatly reduced their monthly costs all while integrating with Office Online. EPC Group also worked to develop several PowerApps solutions that were tied in with Microsoft flow to automate many HR as well as approval processes which has provided a great deal of ROI to the organization. Lea+Elliot has found that the increased ROI from time saved around the now automated processes as well as the increased collaboration is making a direct impact on the company’s bottom line.